A new study, published in the journal Biology Letters this week, suggests that feathers were less prevalent among dinosaurs than previously believed. Scientists examined the fossil record of dinosaur skin and combined this with an evolutionary tree to assess the probability of feathers appearing in different dinosaur groups. This analysis demonstrated that the majority of non-avian dinosaurs were more likely to have scales than to exhibit signs of 'feather-like' structures. "As palaeontologists we are at the mercy of available data, which given the interest in the field are ever changing. Our study shows that dinosaurs experimented extensively with their 'outer look' and potentially independently along separate evolutionary lineages. That is what the data allow us to say at present" says Nicolàs Campione, researcher at the Department of Earth Sciences, Palaeobiology, Uppsala University. The presence of feathers in birds and their immediate ancestors - theropod dinosaurs like Velociraptor - is uncontroversial, but their presence or absence in other dinosaur groups, such as those including Triceratops and Diplodocus, has been highly debated. Several recent discoveries had suggested that filament-like 'protofeathers' might be ubiquitous among dinosaurs, but the new research suggests that the common ancestor of dinosaurs did not necessarily have protofeathers and that the quills and filaments in some major plant-eating dinosaur groups were evolutionary experiments that were independent of true feather origins. "Using a comprehensive database of dinosaur skin impressions, we attempted to reconstruct and interpret the evolutionary history of dinosaur scales and feathers. Most of our analyses provide no support for the appearance of feathers in the majority of non-avian dinosaurs and although many meat-eating dinosaurs were feathered, the majority of other dinosaurs, including the ancestor of all dinosaurs, were probably scaly" says Paul Barrett professor at the Natural History Museum. 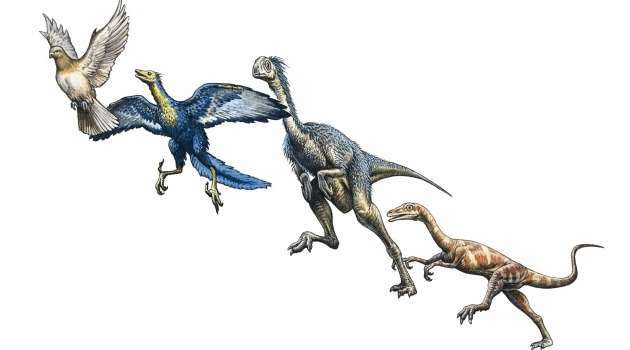 "Current data, for the most part, suggest that the common ancestor of dinosaurs was not feathered. However, this is a hypothesis that can only be tested with the discovery of new fossils with preserved skin and/or feathers. In particular, we need fossils that fill key locations in the evolutionary tree of dinosaurs" says Nicolàs Campione.